Ask the Ancients: Astonishing Advice for Daily Dilemmas by Sylvia Gray is a collection of fifty-two short essays about the classical world and its relevance today. The premise, that the problems faced by people in the ancient world-and the solutions they employed-can give us insight into solutions for the problems that people face today, is not something that students generally expect to discover when they first learn about the humanities. In fact, in the Introduction and Explanation, the author herself states that, having read as many works by authors from classical antiquity as she could get her hands on, she was “constantly surprised by the universal aspects of human experience that shone through.” These universal aspects of humanity, told by the voices of the distant past, have the power to invite students to participate in twenty-five or more centuries of a conversation that’s not over yet. The essays are divided into ten categories: Career and Workplace, Health and Beauty, Food and Fun, Lifestyles, Human Relations (the section with the most articles), Sociopolitical Issues, Government, Morals and Ethics, Metaphysical, and Ultimate Questions. Some of the ancient authors whose ideas are paraphrased include Xenophon, Ovid, Pausanias, Catullus, Aristotle, Julius Caesar, Quintilian, Herodotus, Vitruvius, and Sappho. Each article begins with the statement of a problem or question, followed by a catchy phrase as a sort of subtitle. The article presents the name of some ancient thinker along with his/her relative time and place in history. The, the students read a short paraphrase of the thinker’s take on the issue, often presented with clever ways to think about the problem today. At the end of each short article is a brief reference to the source of the commentary. The book ends with a numbered bibliographical list of the translations used for each article. Teachers in high schools or colleges can use Ask the Ancients as background information to start conversations about larger issues that relate to students’ lives. One way to accomplish this would be via collaboration with teachers of various courses such as Contemporary Issues, Civics, Health and Physical Education, Career Education, and Home Economics. By discussing with the teachers of these courses what upcoming topics are planned for their courses, Latin instructors using this book can make the kinds of interdisciplinary connections that keep students engaged. Ask the Ancients does not propose to be an exhaustive encyclopedia of all of the experiences recorded by the writers whose works are at foundation of our contemporary world. Rather, the author has collected various ideas expressed by many authors from the eighth century BCE co about the second century CE. To be sure, the Latin language continued to be employed by the greatest thinkers of the Western World for many centuries after these authors flourished. The book acknowledges that reading the works of other authors who discuss similar topics often presents conflicting points of view. These statements are not intended as criticisms of the book, but rather, simply descriptive, so that the reader knows what to expect. There is one important consideration for teachers planning to use a book of this scope. The ancient world was a complex era, and the ideas that students can discover are often nor the ideas that our modern world endorses. Ask the Ancients does not shy away from presenting these ideas and themes, making the work a more complete picture of ancient thought. Thus, teachers should read the articles ahead of rime and choose the topics and themes that suit their school communities so that they can find the greatest success with this book as a classroom resource. Thanks to everyone who came out to Vie de Boheme to celebrate the release of Ask the Ancients: Astonishing Advice for Daily Dilemmas! 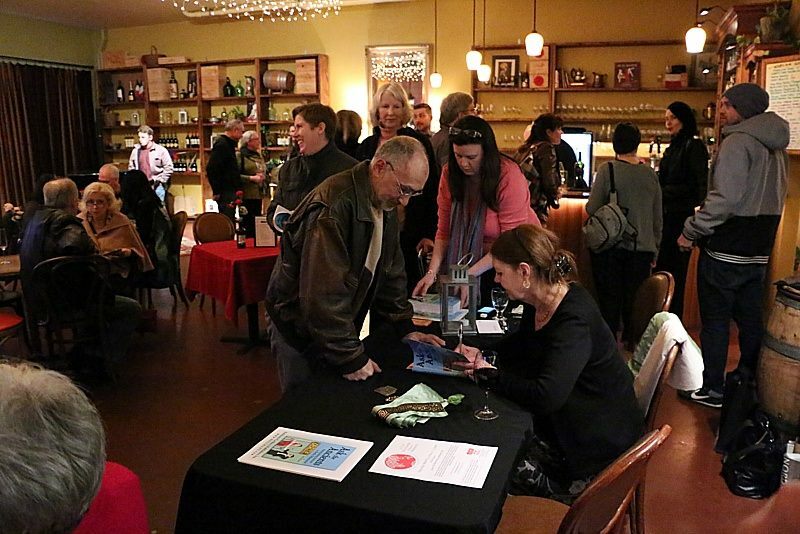 We packed the house and Julie From Wallace Books sold out of the copies she brought! 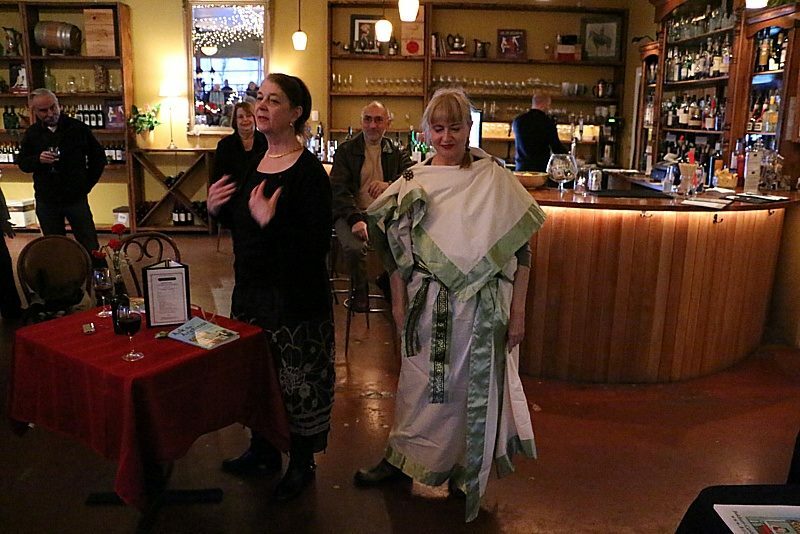 A friend models a doric chiton – perfect party attire! Sylvia Gray speaks about Ask the Ancients to a packed house. 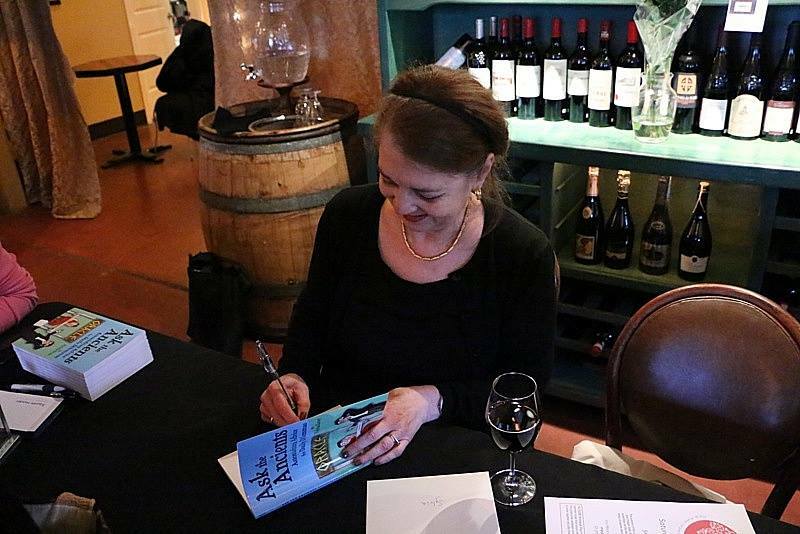 I’ll be having a book release party at Vie de Boheme, Sunday, February 23rd, starting at 5 PM! Ask the Ancients: Astonishing Advice for Daily Dilemmas is a fun book that answers “Dear Abby” type questions from antiquity – with sometimes surprising results. 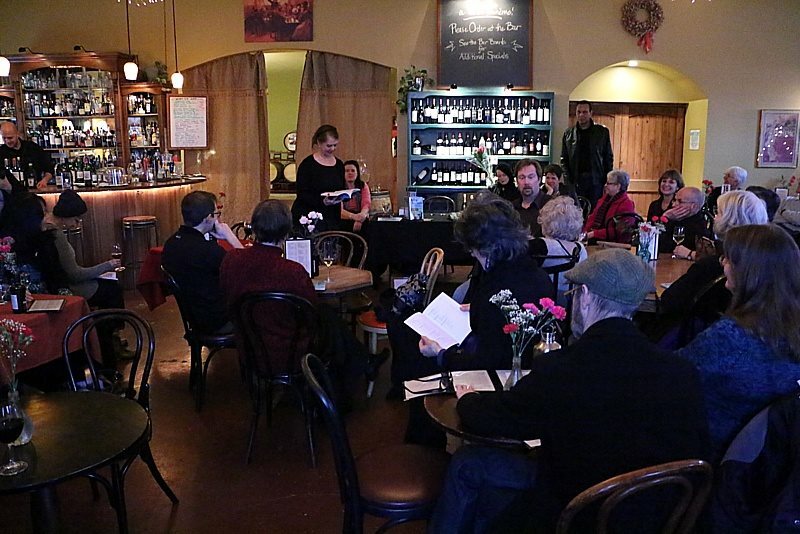 The party will be fun as well, with Vie de Boheme’s great wine and food available, and French cabaret & tango music group Padam Padam will pick up where the book party leaves off. Children are welcome! Join us at Vie de Boheme in the city’s SE warehouse district Sunday, February 23rd from 5-7pm.